Asos skirt (sold out) but keep an eye out! Love this too! Palms and leaves are THE official print for SS2016. Although it can look a bit overwhelming, when styled simply, it's quite a stunning alternative to your basic florals and stripes. 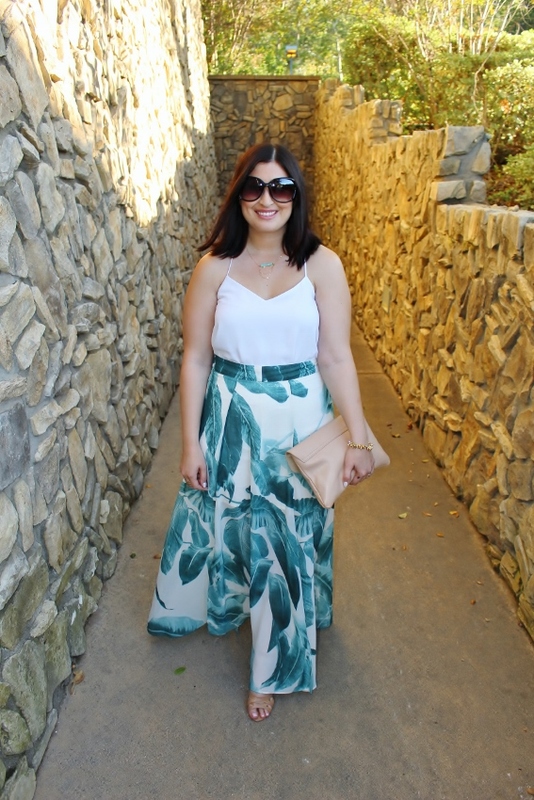 I originally saw this maxi skirt on a high-end blogger, but was shocked when I clicked her link and was directed to Asos. I love Asos! Affordable, trendy clothing that has become a staple in my online shopping. I was going to wait to wear this in Hawaii, but I just couldn't resist! It's too pretty to hang in a closet unworn. I'm still bringing it with me for a nice dinner out, so don't be surprised if you see it again soon. I don't plan on taking too many outfit photos while on vacation, mostly because I want to give Nate a little break from being the "photographer husband". I'm thinking of maybe just doing some flat lays so you can get a feel for my vacation style. However, I can't imagine a more perfect outfit for Hawaii than this one so Nate might have to take a few shots! We leave bright and early tomorrow morning and will be gone for nine days, so in the meantime, two of my dear friends are taking over Beautygirl24. I hope you ladies enjoy some different content while I'm away! Of course, you can follow me on IG and snapchat for updates. 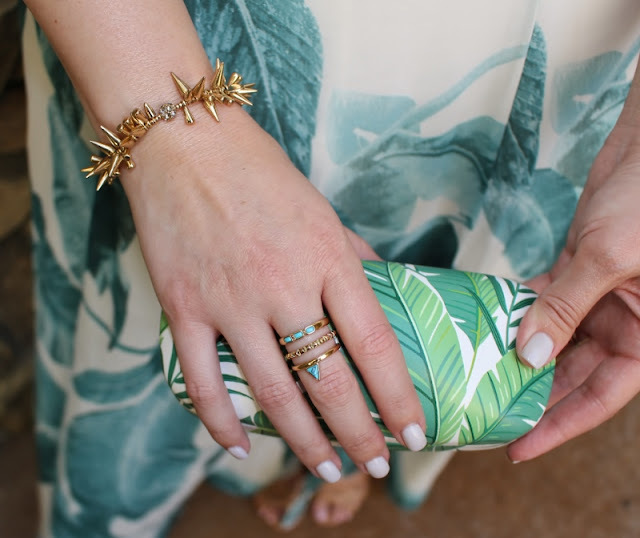 So in love with this skirt on you...I'm obsessed with palm / leaf print right now! OMG this is so perfect for Hawaii, that skirt is stunning on you. 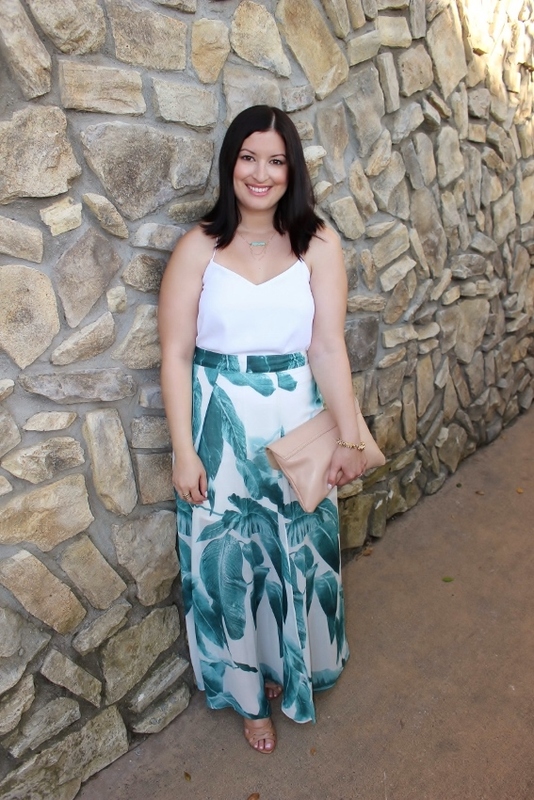 This skirt is a stunner and I love how you styled it with a classic white Barcelona cami! I hope you guys have an amazing time in Hawaii and I'll see you when you get back! This skirt could not be more perfect!! I am loving the print and that it is maxi length. Perfect with your white cami since the skirt has so much personality. HAVE FUN!!!!!!! Noelle you are looking gorgeous in this outfit! love the print and you are wearing it well. Def enjoy your vacation to the max. We often get to caught up with pics and social media to truly enjoy time away. I completely agree! I'm going to make a concerted effort to be present and not on my phone the entire time! I want to take pictures to post here later on when I get back, and not post so often on Instagram. Love palm print - I'm always looking for great palm print pieces! Thank you ladies all for the well wishes on my vacation! This time of the year is my favorite. I hope you enjoy your week! still obsessing over palm print!! love that skirt. All I've got to say is SLAY GIRL SLAYYYYYYYY!